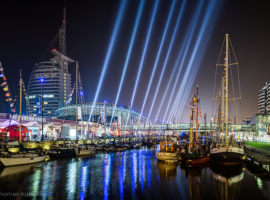 For Sail Bremerhaven 2015, AO Creative created a lighting, laser and pyro show and enthused the international spectators. 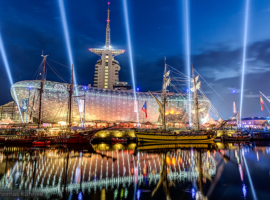 Every five years, Bremerhaven is given over to sailors when over 250 ships from 20 nations drop anchor in the harbor to participate in the Sail Bremerhaven festival, one of the largest gatherings of windjammers and traditional sailing ships in the world. The wide variety of vessels, ranging from schooners to cutters, the flotillas, the open ships, the live bands and the wide variety of culinary delights on offer drew thousands of visitors to the quayside of the coastal town. 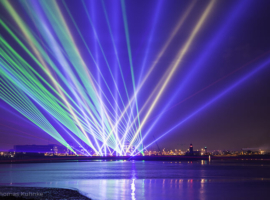 AO Creative designed, programmed and realized a fourteen-minute, color-dynamic show “Weser Lights”. 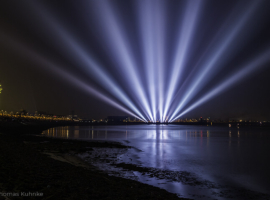 Over a dozen searchlights were installed at the Weser lido (Weser-Strandbad) for the five-day international windjammer festival. FALCON BEAM 7000W and 3000W searchlights as well as RGB and YAG lasers were among the devices used. AO Creative together with teams from Comet Feuerwerk and laserfabrik showlaser coordinated the lighting and laser elements with the altitude fireworks. 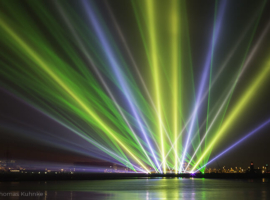 With its musical accompaniment, the light, laser and pyrotechnic show illuminated the coast three evenings in a row. In addition, AO Creative staged a light show in the old harbor. Each evening FALCON FLOWER 3000W and FALCON CMY LED-VIDEO LED/xenon hybrid searchlights performed here their choreography in the night sky. Their beams reflected in the harbor basin emulated the potpourri of masts. At the end of the festival, the organizers announced that over 1.2 million visitors from all over the world had witnessed this display of the largest and most beautiful sailing ships in the world. Sail Bremerhaven was opened by its patron, German president Joachim Gauck.